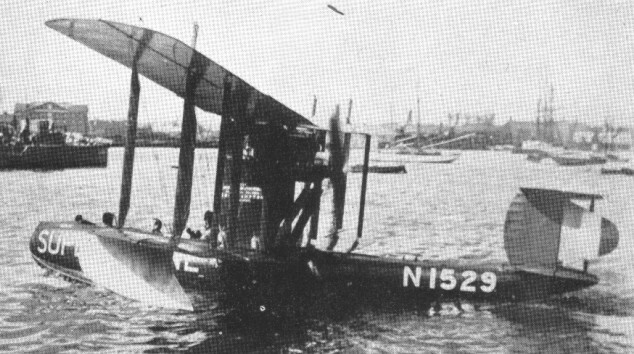 Designed in 1915 to serve in patrol and reconnaissance roles, the AD Flying-Boat was a two seat, single engined, unequal-span braced biplane. The wings could be folded for stowage, and a braced ailplane had twin fins and rudders. Construction of two prototypes was begun in May 1915, with May, Harden & May of Southampton building the first hull. The hull being designed by Lieutenant Linton Hope. The first was then completed at Southampton by Pemberton-Billing Ltd, who also built the second prototype and the 27 production aircraft. The first prototype was powered initially by a 200 hp / 149kW Hispano-Suiza with a four blade pusher prop. The original order was for 85 aircraft but after the first 27 the remaining contracts were cancelled in March 1918. The aircraft were used by the Royal Naval Air Service, armed with one forward firing 0.303 in Lewis gun and provision for eight light bombs. All 27 production aircraft were declared obsolete in late 1918. Nineteen were repurchased by Supermarine soon after the war and converted for civil use as the Supermarine Channel.